A note on usage: when uncommenting, it’s best to ensure that the selection begins at the leading forward slash and ends at the trailing forward slash (in other words that there’s no whitespace at either end of the selection). I have built in some attempt to strip leading and trailing whitespace, but an accurate selection will always be the most reliable. As I noted in an earlier post, one of Yosemite’s annoying usability regressions is that Apple have removed the Dock Preferences from the  menu. I was so irritated by this that I thought I’d just slip them back in to the menu bar. 😉 Hence, FastTasks 2 from v1.6 onwards now lets you manage most Dock preferences from the menu bar again! Security researchers have this week been getting themselves het up about a new malware threat to both iOS and OS X. WireLurker appears to be emanating out of Chinese file exchange sites and, at least at the moment, looks fairly limited in both its spread and its damage (update: Business Insider is reporting that Apple has blocked WireLurker-infected apps from launching). However, researchers at Paolo Alto Networks are pointing out that what makes WireLurker particularly worrying is that the malware exploits weaknesses in Apple’s software that could, they claim, be easily be used for far more dangerous threats. You can easily scan for the malware threat with my free app FastTasks 2 (v 1.53 or later). If you don’t see the warning as in the screenshot above or any results in the Analyser ‘Issues’ pane, you’re clean of any of the currently known files associated with WireLurker. If you do see the warning, locate the infectious files from the Analyser pane and delete (OS X will demand your Admin password to remove some of them), then restart your mac. With OS X’s Messages app now able to send SMS, some might find it useful to have an idea of how many characters have been typed in the message field. 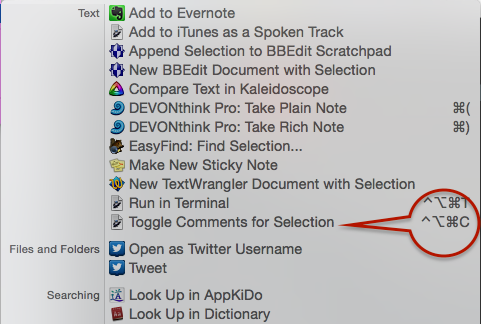 Here’s a bit of AppleScript and Automator magic that will do that for you. Assign it a hotkey to make it a Service, and you can quickly get a character count with the stroke of a key (alternatively, you can invoke it from the Services menu).